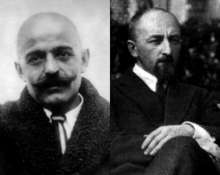 G. I. Gurdjieff (1866-1949) was a remarkable teacher, writer, composer and choreographer. His teaching, some-times referred to as the ‘Fourth Way’, blends the inner search of eastern and western traditions and speaks directly to the deeper questions facing so many spiritual seekers today. In collaboration with Thomas de Hartmann (1885-1956), a gifted Russian composer, Gurdjieff created an impressive and inspiring body of music. Charles Ketcham is considered one of its foremost interpreters. An open discussion follows concert. Charles Ketcham has conducted many of the major orchestras in the United States, including the Pittsburgh Symphony, the Dallas Symphony, the St. Louis Symphony, The Denver Symphony and the Portland Symphony. He has held the positions of Resident conductor with the Utah Symphony and the San Diego Symphony as well as Music Director of the San Diego Master Chorale and Principle Conductor of Ballet West. He has also served as principle guest conductor of the Utah Opera. In 1963, Mr. Ketcham, studied conducting with Eric Leinsdorf at the Tanglewood Institute. In 1969, a Fullbright Fellowship enabled Mr. Ketcham to study in Vienna with the renowned Wolfgang Sawallisch and at the Sienna Academy with the legendary Franco Ferrara. During that period, he also served as Music Director of the American Opera Workshop in Vienna. Mr. Ketcham was subsequently appointed Associate Conductor of the Gulbenkian Orchestra, conducting tours throughout Portugal, Spain and Africa. One of the sternest challenges in the symphonic repertory, Bruckner’s Fourth Symphony … was a superior effort by all … A healthy share of the credit should go to the guest conductor, Charles Ketcham”. “Ketcham’s best work was in Stravinsky’s “Firebird Suite’. Everything was very much in place. He provided a stable underlying pulse, clear entrances throughout, a strong crescendo of energy in ‘The Infernal Dance’. and a sense of poetry in the ‘Lullaby’. “… polished playing by the Philharmonia under Charles Ketcham.”. Mr. Ketcham has recorded for RCA Red Label, Pro Arte and Varase Saraband. Today Mr. Ketcham is considered one to the leading interpreters of the Gurdjieff / de Hartmann Music. Along with Linda Daniel Spitz and Laurence Rosenthal, Mr. Ketcham has edited the definitive edition of the Complete Gurdjieff / de Hartman Piano Music and together recorded the complete works for the German Recording label, Wergo Schallplatten.